Happy new week, my friends! 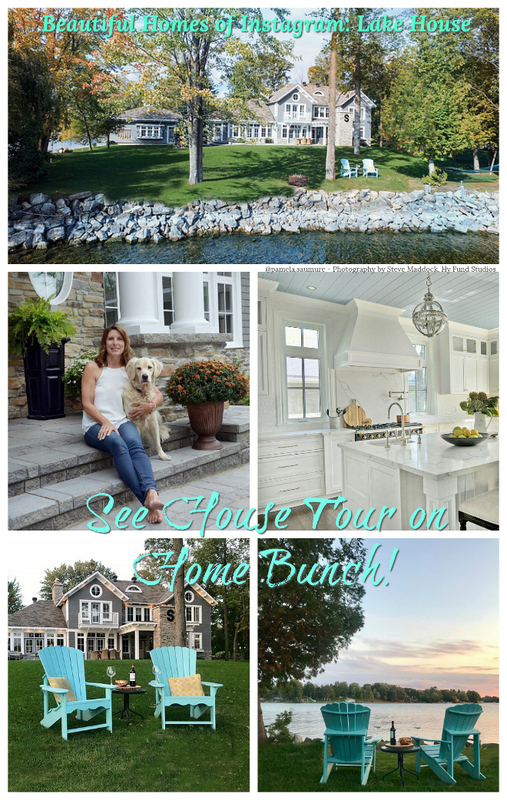 How about starting this brand new week seeing a beautiful home designed by one of my favorite interior designers, Bria Hammel Interiors. Sounds good, right? 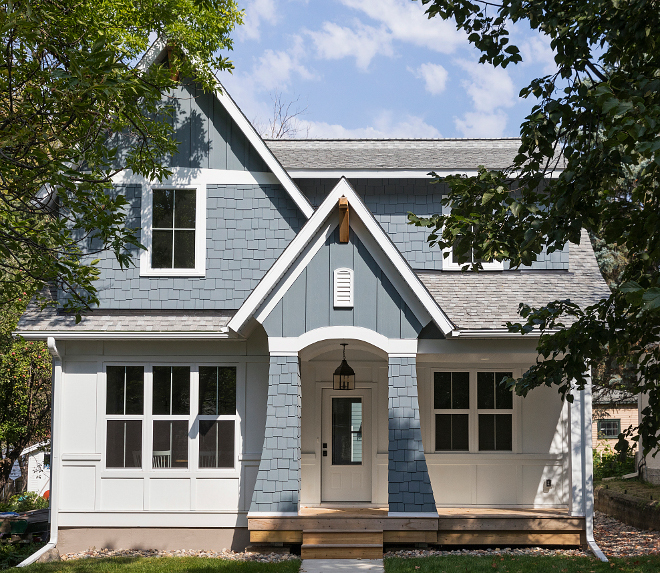 Recently built by SD Custom Homes, this family home is as cute as it get can get, from its inviting architectural details — did you see that front porch? — to its interiors and the home decor. 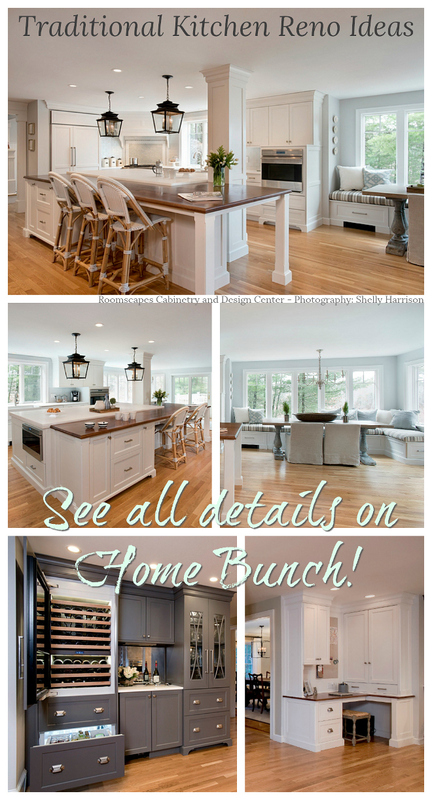 The home features classic traditional with a fresh feel, and a hint of coastal influence. I hope you find a comfy chair, relax for a few minutes and get ready to be inspired! Siding: James Hardie Evening Blue. Shingles: Certainteed Landmark Cobblestone Grey. 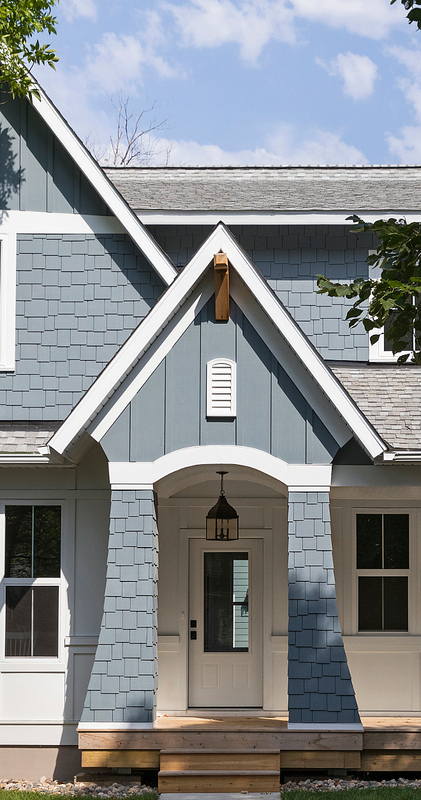 Exterior White Trim: James Hardie Arctic White. White Front Door Clear Glass 3/4 Lite: Here. Similar Door Hardware Set: Here. 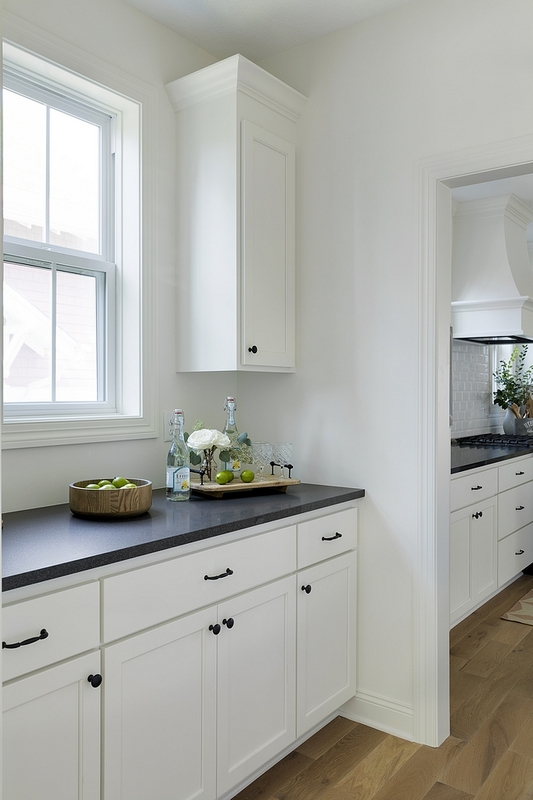 Kitchen Cabinet & Walls Paint Color: Benjamin Moore White Dove OC-17. 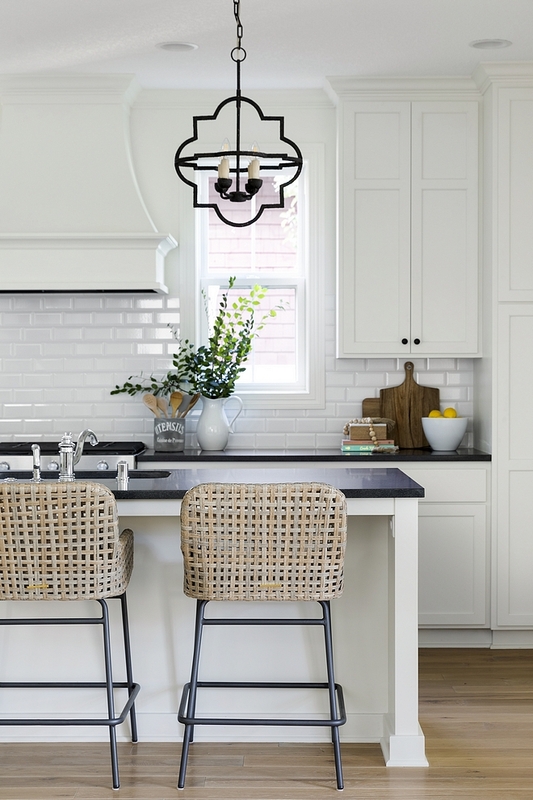 Kitchen Backsplash: White Beveled Subway Tile. 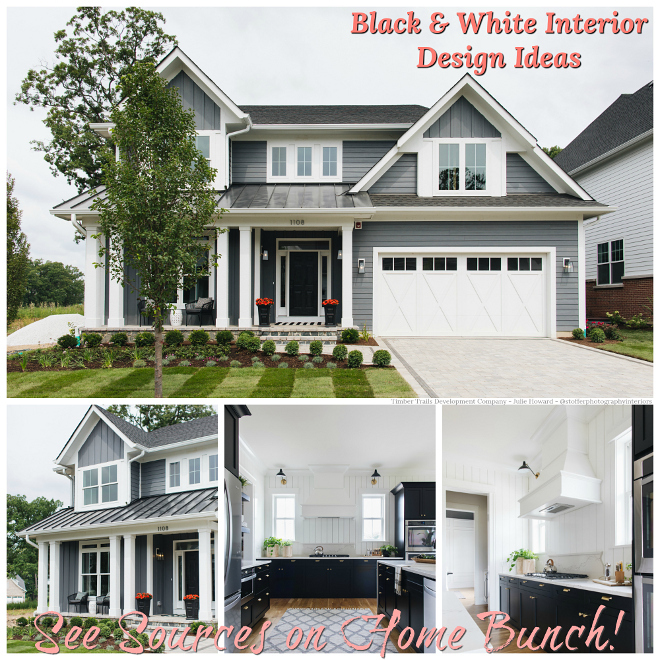 I love the off-white kitchen cabinets with the black accents. It’s a new take on a timeless look. 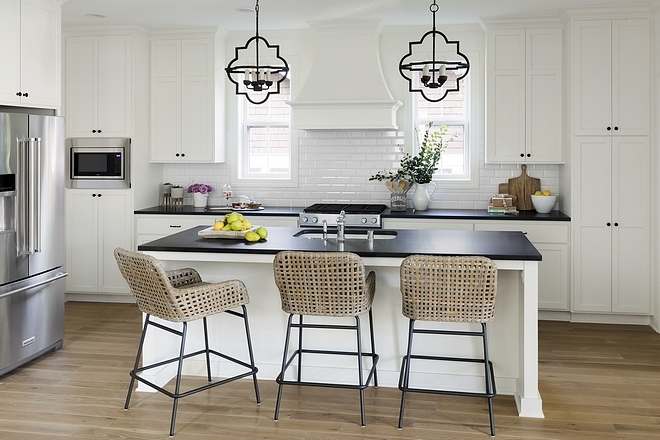 Similar woven counterstools with metal base can be found here, here , here & here. 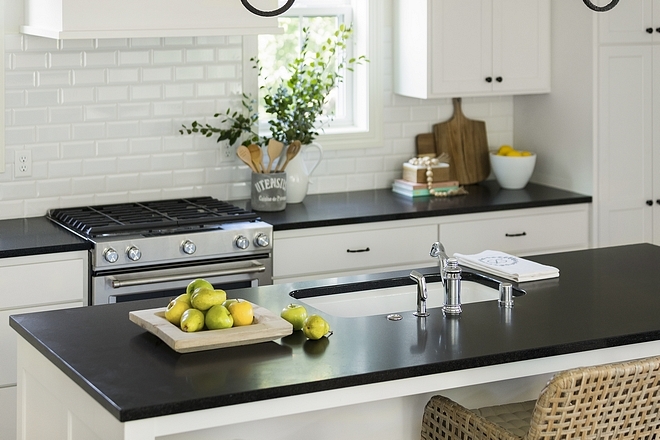 Kitchen Countertop is Honed Opalescence Granite. 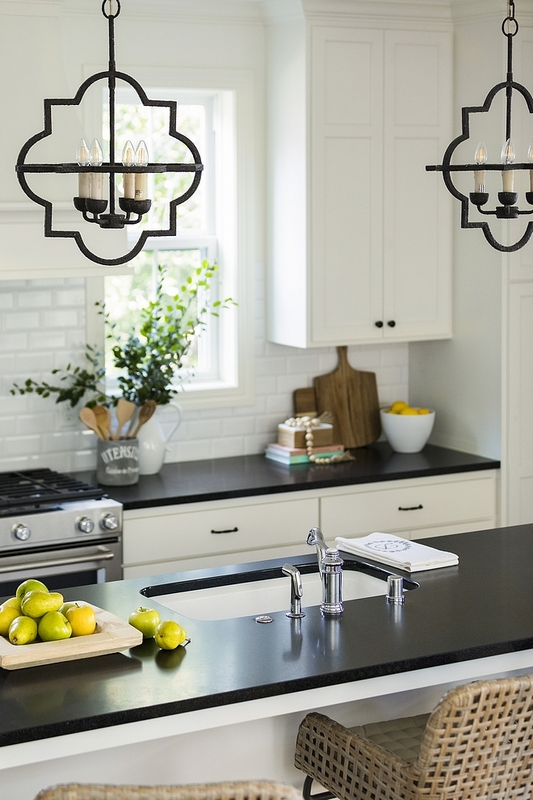 Quatrefoil Pendant Light: Gabby Home. 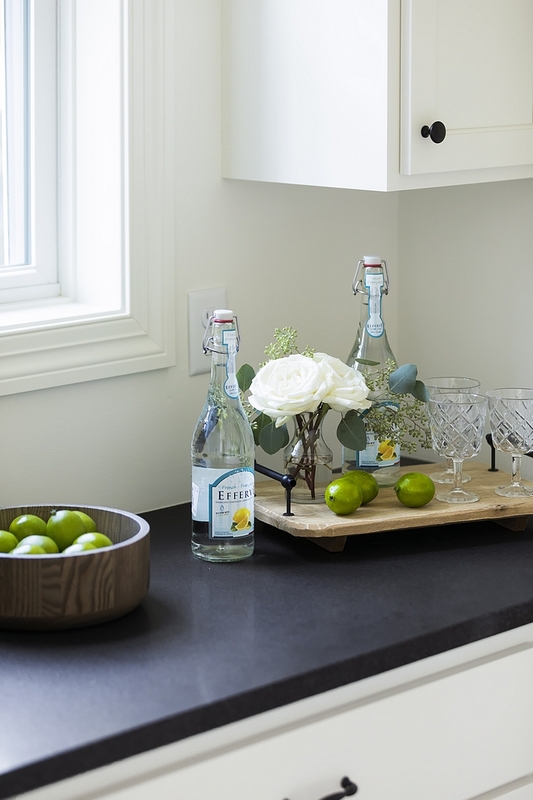 The butler’s pantry also features honed Opalescence Granite. It looks great against the white cabinetry. Butler’s pantry opens to an inviting dining room. 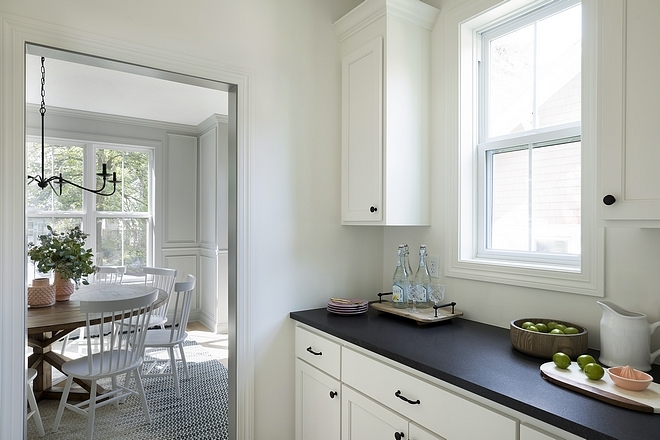 Grey Paneling Paint Color: Benjamin Moore Coventry Gray HC-169. 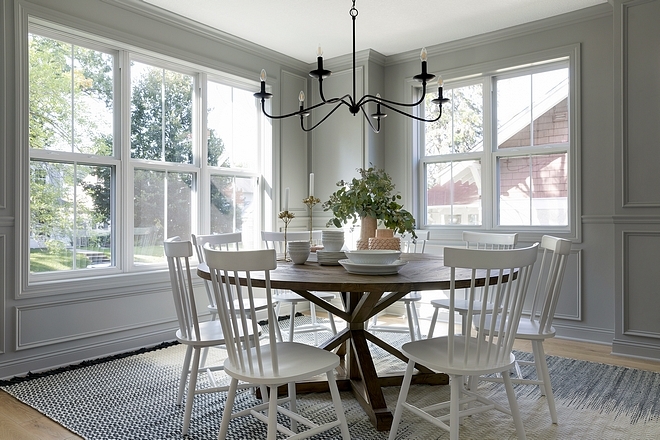 I love the relaxed yet beautiful feel of this grey dining room. 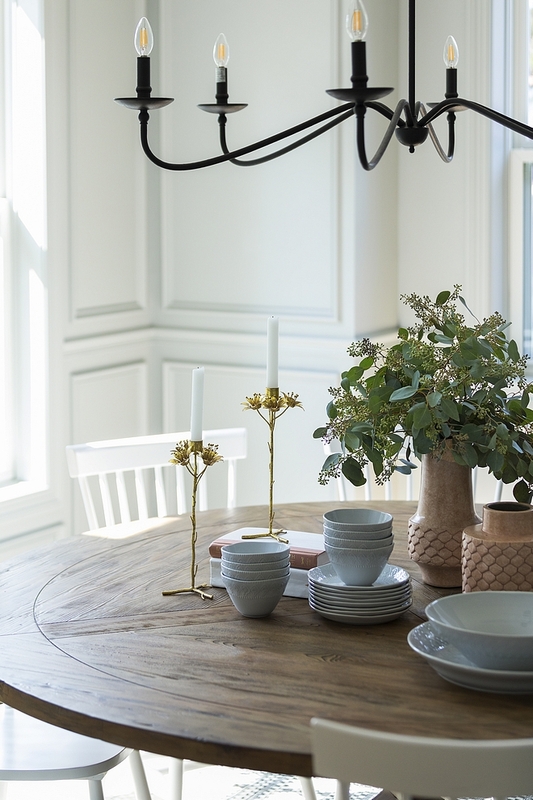 The dining table can be found here – similar (different sizes) here, here, here, here, here & here. 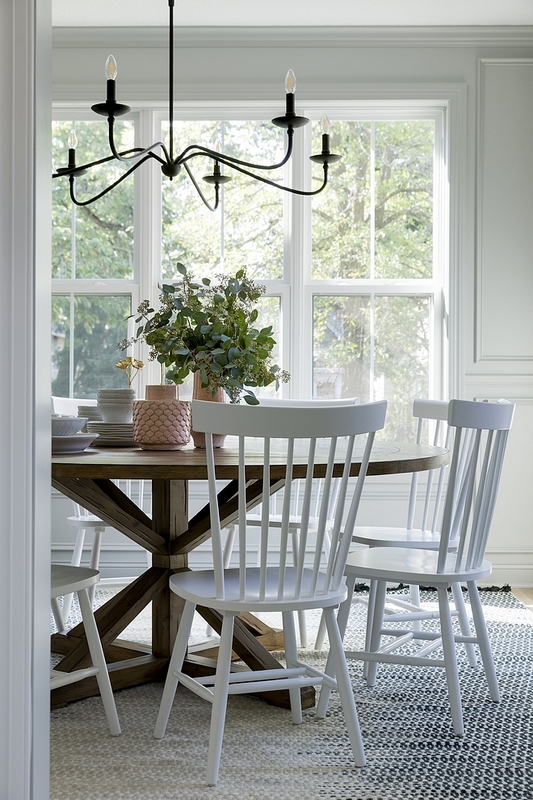 Dining Chairs are from Serena & Lily – similar here. 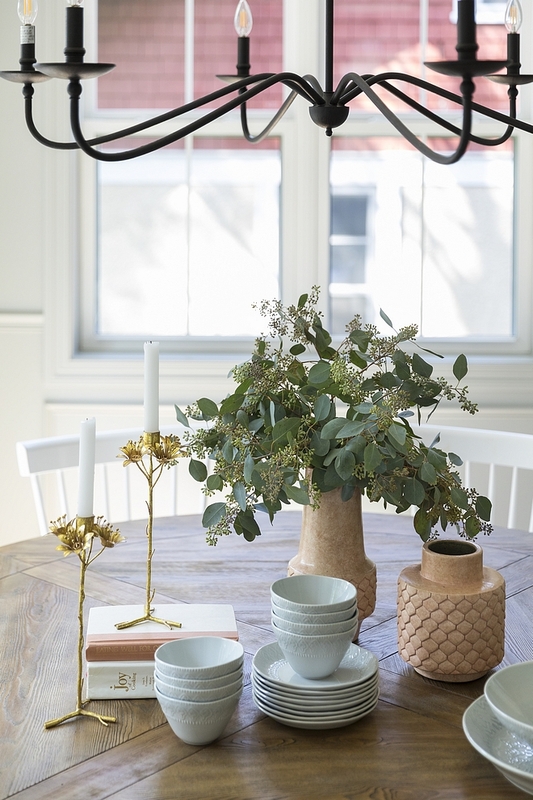 I love the idea of using easy table decor – nothing too fancy nor too hard to achieve. Beautiful Candleholders: Here & Here. Similar Vases: Here & Here. Faux Greenery: Here & Here. The kitchen opens to the living room. The living room features a painted brick fireplace and inviting decor. Similar Sofa: Here, Here & Here. 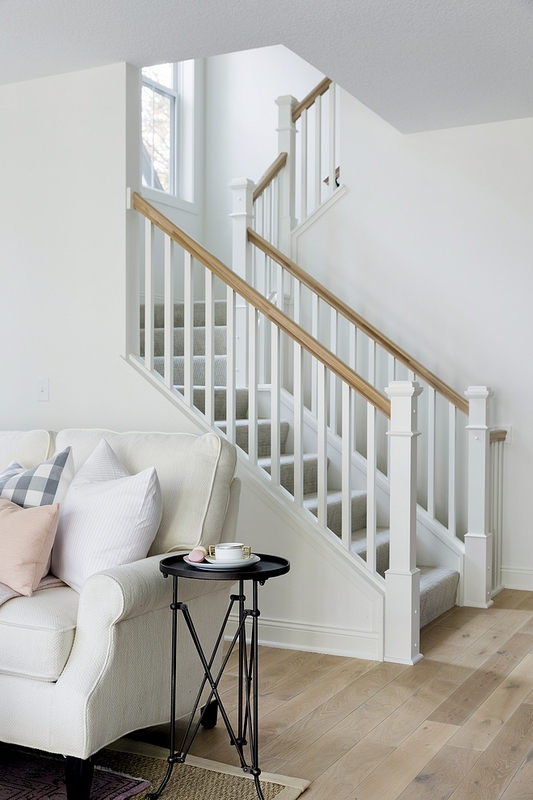 Walls & Paint Color: White Dove OC-17 Benjamin Moore. This is a good example of how to layer rugs. 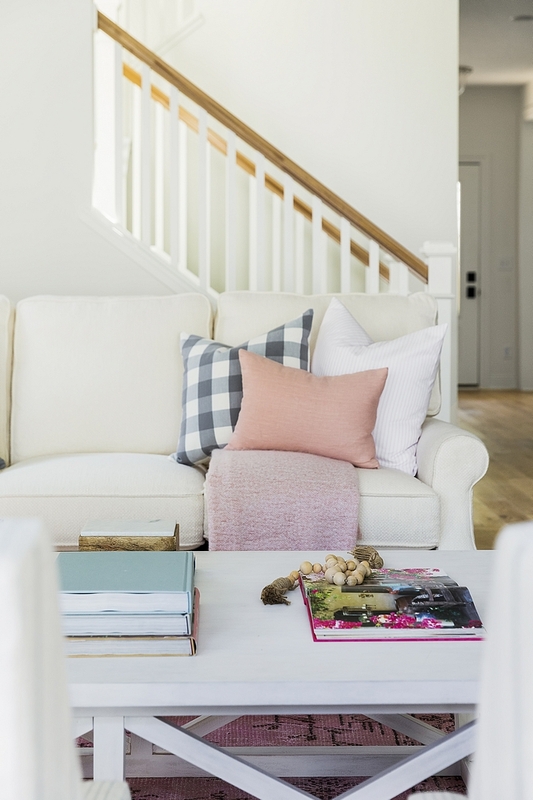 You should use a neutral rug, preferably a natural fiber rug, with a patterned rug on the top. Natural Fiber Rug: Here, Here & Here. Patterned Pink Rug: Here, Here & Here. 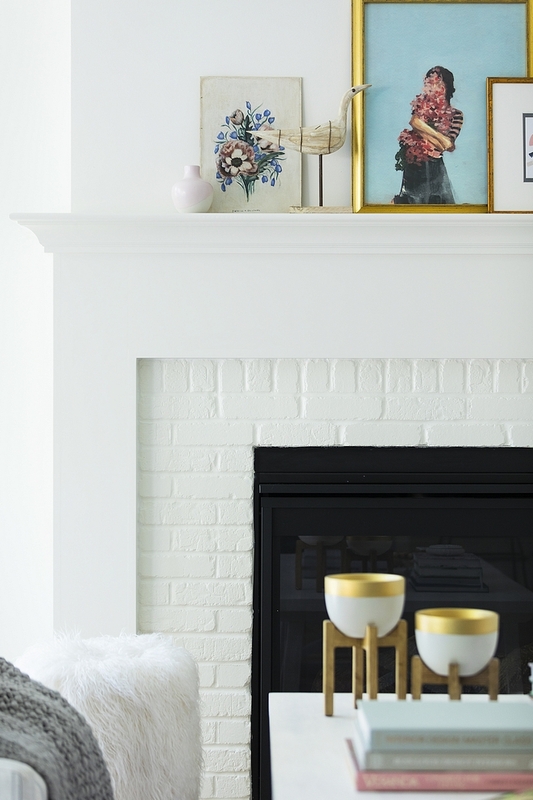 The painted brick fireplace paint color is White Dove by Benjamin Moore. 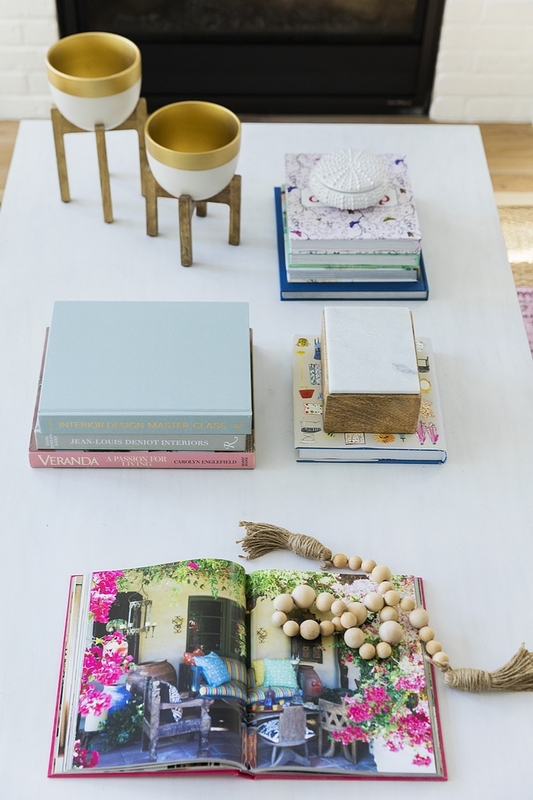 The coffee table decor feels collected and colorful – perfect for this time of the year! Trim Paint Color: White Dove OC-17 Benjamin Moore. Similar Desk: Here , Here & Here. 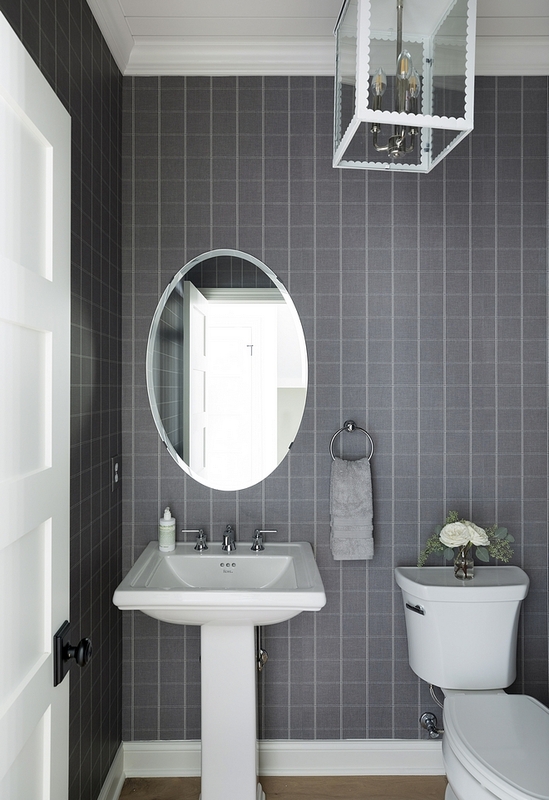 The powder room features plaid wallpaper and a pedestal sink. 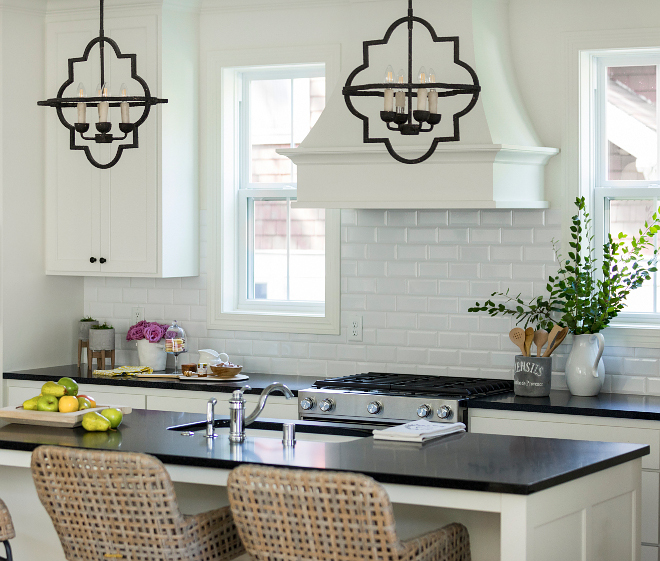 Lighting: Shades of Light Scalloped Trim Hanging Lantern. Plaid Wallpaper (different colors): Here. 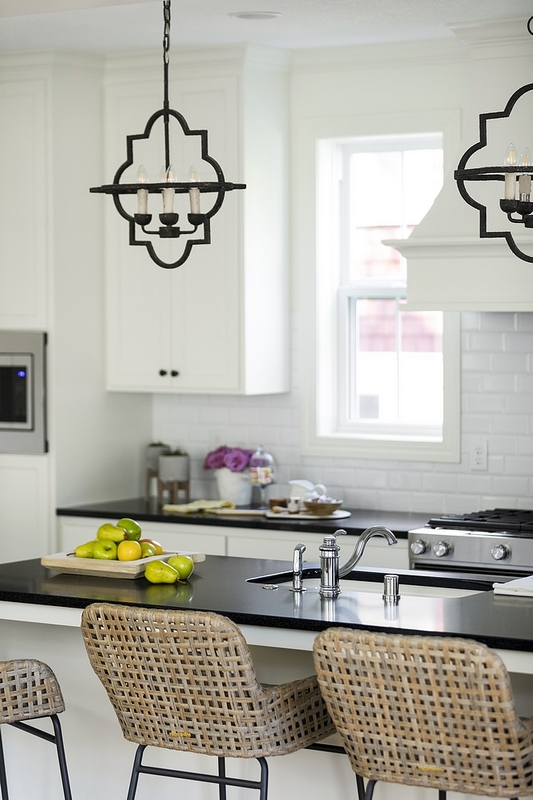 Cabinet Paint Color: Benjamin Moore Graphite 1603. Countertop is MSI Arctic White Quartz. Shower Tile: 3×6 Subway Tile. 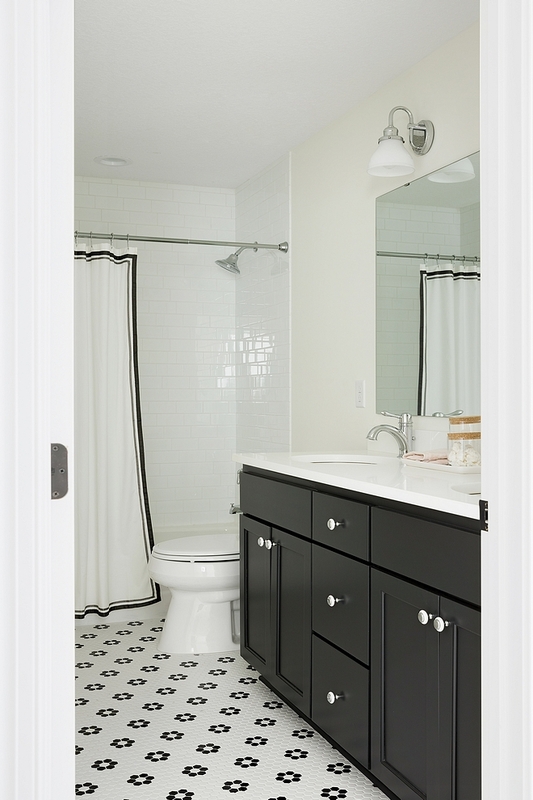 Floor Tile: Hex Matte White w/ Black Flower porcelain. 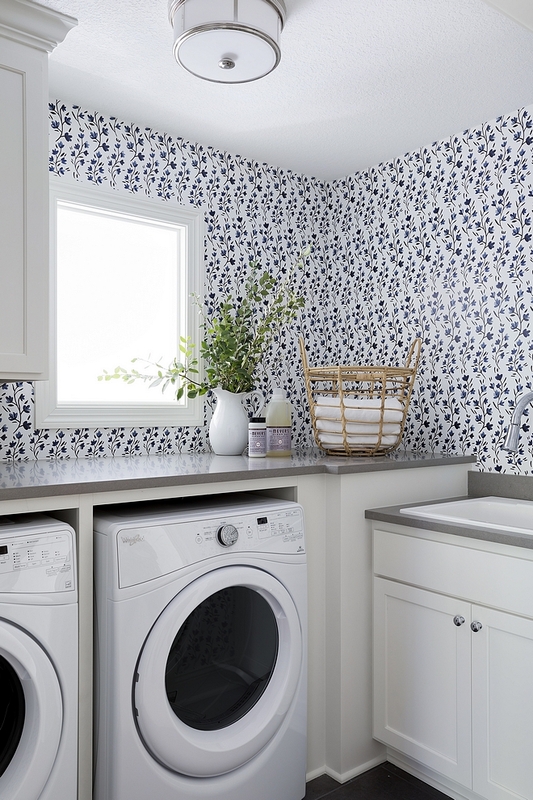 Laundry Wallpaper: Caitlin Wilson Blue Belle Wallpaper. Similar here, here, here, here & here. Laundry Countertop: MSI Fossil Grey Quartz. Similar Rattan Basket: Here & Here. 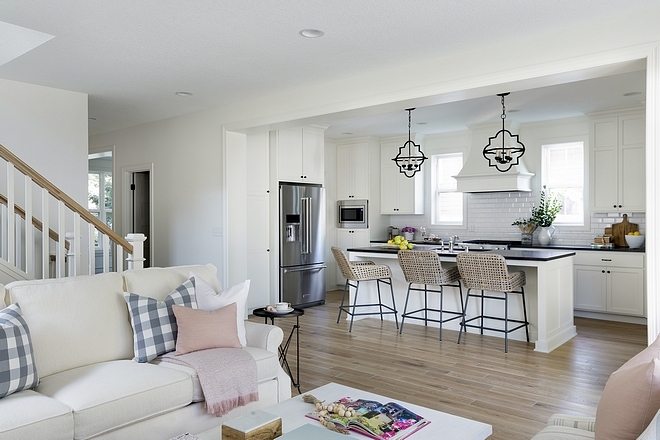 Mudroom walls and cabinetry are also painted in White Dove by Benjamin Moore. 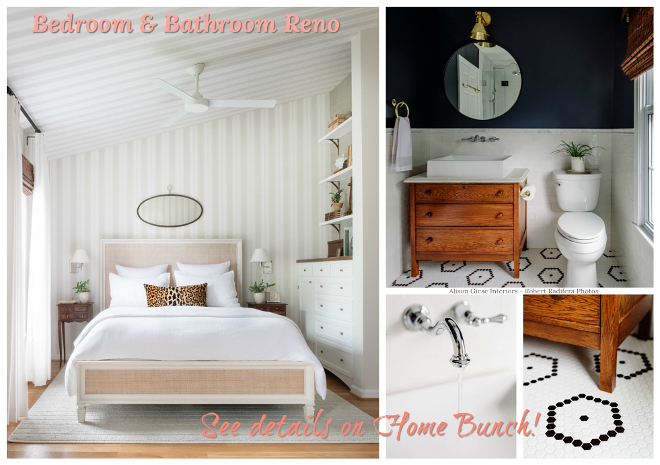 Interior Design: Bria Hammel Interiors – Instagram – Facebook.